SR0801 - BORAH BERGMAN - GIORGIO DINI: "ONE MORE TIME"
Seven extemporaneous improvisations, played in an afternoon in July 2007, - an outstanding performance of the historical newyorker pianist Borah Bergman in duo with bassist Giorgio Dini: after the released CDs with Thomas Chapin, Anthony Braxton, Evan Parker, William Parker, Hamid Drake and many other known names of the 'New Stream' of world Jazz, the very first Borah's recording in duo with double bass. You can't miss it. 4. ENOUGH FOR HIS KEEP 4'24"
6. A PATTER OF FOOTSTEPS 1'31"
7. NO MORE COSMETIC 9'20"
SAVE ON THE SHIPPING CHARGE ORDERING 2 OR MORE CDs! Email info@siltarecords.it for quotations of your combined order! The near-80 year old Brooklyn-born Borah Bergman is one of the most singleminded and unique pianists in the history of jazz. Crediting Bud Powell as well as Art Tatum's dexerity, Teddy Wilson (with whom he briefly studied), Lennie Tristano's hornlike phrasing, and Thelonious Monk's stride as his main pianistic influences - he has consciously and uniquely emphasized equality between his left and right hands epitomized by frequent cross-handed playing. Influenced also by chamber music and Bach, and Dixieland/New Orleans where all of the instruments play contrapuntally and polyphonically, Bergman has created a style which allows him to improvise differently than any other pianist in the history of jazz. Though he didn't play piano until he was in his 20s - he was well into his 40s for his 1975 recording debut (Discovery, Chiaroscuro Records) for which he played the same piano Earl “Fatha" Hines had played and recorded on earlier that day in the studio - Bergman has always been determined to create a new way of playing. He spent several years teaching his left hand to be able to play everything his right could play, which for a while took the form of compositions and improvisations entirely for the left hand. He was also inspired by the example of John Coltrane's “Chasin' the Trane" to build a style of great endurance, and by the music of Ornette Coleman, and to have that style reflect a greater equality of its parts. He has credited his parent's left-wing beliefs for these ideas of equality inherent in his even-handed, ambidextrous approach. Regularly hailed for his originality, Bergman continues to forge a new pianistic path as a one-of-a-kind pianist, composer and improviser whose originality lies in his entirely personal approach and utilization of left-handed and cross-handed techniques. (by Laurence Donohue-Greene, ALL About Jazz New York). Giorgio Dini has a tremendous depth to his knowledge and experience of improvising, coming in contact with jazz masters Percy Heath, Charlie Haden and Pierre Michelot in his youth and subsequently immerging himself in renaissance, Arabic and avant-garde music. This shows in the bassist’s confidence, his unbounded imagination and his singular approach, which draws col legno wails, percussive flutters, microtonal slides and heavy rounded bass notes from his instrument. 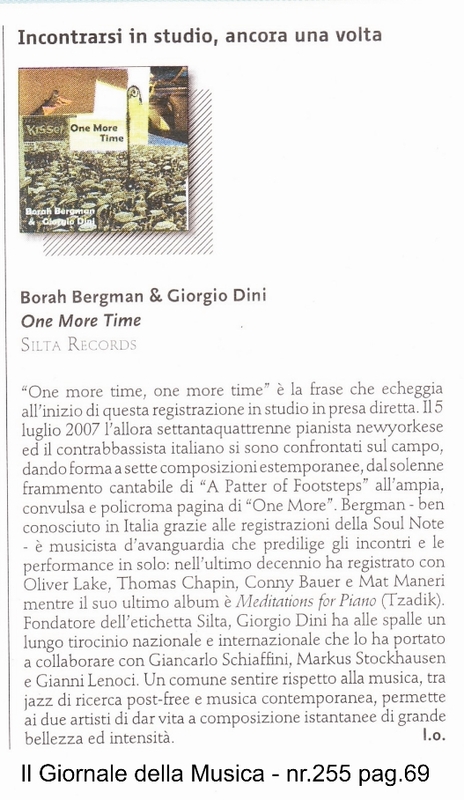 (as reviewed by Double Bassist nr.38).